Trump Meets 3 Americans Held In North Korea As They Arrive In U.S. : The Two-Way The dramatic release of the trio, two who were arrested just over a year ago and the third held since 2015, comes amid a thaw in relations between Washington and Pyongyang. 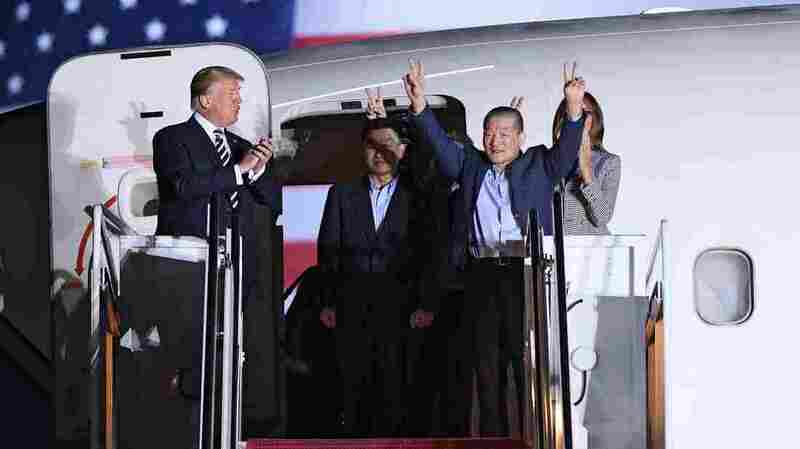 Trump Meets 3 Americans Held In North Korea As They Arrive In U.S.
President Trump applauds as Kim Dong Chul (2nd R) gestures upon his return with Kim Hak Song (C) and Tony Kim (behind) after they were freed by North Korea, at Joint Base Andrews in Maryland. Three American men who had been held by North Korea touched U.S. soil once again early Thursday, where they were met by President Trump, who has hailed his diplomacy with North Korean leader Kim Jong Un for winning their freedom. The trio — Kim Dong Chul, Kim Hak Song and Tony Kim – all held on charges of espionage, arrived at Joint Base Andrews just outside of Washington, D.C., at about 2:40 a.m. ET. Their plane taxied to the meeting area, where a giant U.S. flag was suspended over the tarmac. Shortly after the president and first lady went aboard the plane carrying the freed detainees, they emerged with the president, smiling and waving to cheers and applause from military personnel at the base. "I want to thank Kim Jong Un," Trump said on the tarmac. "I'm very honored to have helped the three folks," he said. Trump said Kim was "nice" for letting the three free before a summit planned between the two leaders, which he said would occur "in a few weeks." Welcoming the detainees back to the United States, he called it "a special night for these three people." One of the three, who appeared to be Kim Dong Chul, spoke for the group, saying "It's like a dream and we are very, very happy." Asked how they were treated in North Korea, he responded through an interpreter, "in many, many ways. For me, it was labor, but when I was sick, they treated me." The three arrived shortly after an official plane carrying Secretary of State Mike Pompeo — who negotiated the release — touched down. They met the president and first lady Melania Trump, who boarded their plane, as well as Vice President Pence, second lady Karen Pence and Pompeo stood at the foot of the stairs. Kim Dong Chul had been jailed since 2015, while the two others were arrested separately in North Korea just over a year ago. "My proudest part of this will be when we denuclearize North Korea," the president said. He said of the North Korean leader, "I really think he wants to do something," adding, "I really think a lot of progress has been made." In a tweet last week, Trump hinted at their impending release, saying that "the past Administration has long been asking for three hostages to be released from a North Korean Labor camp, but to no avail. Stay tuned!" Two of the three – Kim Hak Song and Tony Kim — were detained during Trump's presidency. "Kim Hak-song also worked at PUST and was detained on a similarly vague charge of 'hostile acts' against North Korea. "The third detainee, 60-something Kim Dong Chul, of Fairfax, Va., was sentenced to 10 years in prison and hard labor in April 2016." Exchanging prisoners for an opening with the West has been a common tactic of Pyongyang over the years. However, typically, the détente has been short lived. Last year, North Korea released American Otto Warmbier, a university student who was detained at the Pyongyang airport in January 2016 while on a five-day tour of North Korea. He was later convicted of stealing a propaganda poster and sentenced to 15 years hard labor. However, he was released in June 2017, gravely ill and in a coma. He died soon after his return to the United States. Appearing with the freed Americans on Thursday, Trump said he and Pence had spoken to the family of Warmbier recently. "I must tell you that I want to pay respects to Otto Warmbier, who was a great man who really suffered," he said. North Korea also freed U.S. citizens during visits by former Presidents Bill Clinton, in 2009, and Jimmy Carter, in 2010. In recent months, increased tensions over North Korea's nuclear and ballistic missile programs led to a barrage of insults between Trump and North Korean leader Kim Jong Un as the two openly threatened war. However, Pyongyang suddenly softened its tone, leading to a flurry of diplomacy, rare talks with South Korea last month and a planned Kim-Trump summit. The president has hailed the thawing in relations as a diplomatic breakthrough and chalked it up to his hardline stand with Pyongyang. The release of the Americans is seen as a goodwill gesture by North Korea ahead of those talks. Trump confirmed the Americans' release on Wednesday morning, saying the group was airborne. Later, during a Cabinet meeting, Trump said the three Americans were "fine people" and seemed to be healthy, adding, "I appreciate Kim Jong Un doing this and allowing them to go." For Pompeo, his visit to retrieve the trio was his second surprise trip to North Korea in recent weeks, having traveled there to visit the country's leader in early April while he was CIA director — and before his confirmation as secretary of state. Pompeo met with the North Korean leader for 90 minutes, flashing a fingers-crossed sign to reporters when asked about the detainees' fate, according to The Associated Press. "A North Korean official came to the hotel shortly after to inform Pompeo that Kim had granted amnesties to the three and that they would be released at 7 p.m. local time, according to a senior U.S. official present for the exchange. Carl Risch, the assistant secretary of state for consular affairs, and a doctor went to another hotel to pick up the men and bring them to the airport, the official said. "They finally left custody at 7:45 p.m., and by 8:42 p.m. they were flying home."